There seems to be a harmonic tremor pulse or a change around Grímsfjall volcano. This might be nothing, but the change appears on several SIL stations around Vatnajökull glacier. The harmonic tremor is strongest on Húsbóndi SIL station and Jökulheimar SIL station. This might be something else then magma, glacier movement or sudden flood are an possibility. Húsbóndi SIL station. Copyright of this image belongs to Icelandic Met Office. Jökulheimar SIL station. Copyright of this image belongs to Icelandic Met Office. Currently I don’t know what is creating this change in harmonic tremor. I know it is not weather and this is on too many SIL station to be local noise. The SIL station at Grímsfjall volcano doesn’t show any change, so everything is quiet in that volcano. But this is within Grímsfjall volcano fissure swarm that contains the volcano Þórðarhyrna, it last erupted in the year 1902 and has been quiet since (information about eruptions in Þórðarhyrna volcano can be found under Grímsfjall volcano eruption history). If anything happens I’ll update this article or post a new one. This entry was posted in Grímsvötn / Grímsfjall, Harmonic tremors, Monitoring, Volcano, Þórðarhyrna. Bookmark the permalink. Sorry, i am a poor ignorant in this matter, but is someone can give me some indication of how “read” or see the harmonic tremor in these png ? without some help, i am unable to identify anything and i am very frustrating to be unable to have a little capacity to understand something inside these signals. Thanks a lot by advance. Here is an old article about the subject. This article here also contains the harmonic tremor signal during the last eruption in Grímsfjall volcano. It clearly shows when the eruption starts and how big it was. There is always a lot of noise on the SIL stations, making it difficult to read them. But signals like eruptions and harmonic tremor pulses normally go above the background noise and that makes them stand out. Spikes that go over some time stand out as an example. Great articje john! Please can you post the link of this two SIL stations? Thank’s! They expect a bad weather later today in Iceland, but that appears mostly as an rise on all the SIL stations on all the frequency bands. It appears differently then from a volcano related noise on a SIL station. There are several stations showing tremor rising. Can it be related to bad weather? Yes, there is increase in wind noise. Storm is expected in Iceland late today. Keep an eye on the wind speed. It is important not to rule out noise from other sources, that means, people, cars, animals and so on. Currently there is a strong wind in Iceland, making recording of harmonic tremor and small earthquakes difficult for Icelandic Met Office. This has also increased the noise level on the SIL network. Interesting to read over 1000 years old found because of the melt water.. The news is reporting that this might be from a area that got buried in lava during the Laki eruption in that started in 1783. It must have been a devastating loss for the owner. Or he didn’t loose it and died because of volcanic activity in the area. The owner was long dead when the Laki eruption took place in 1783. The owner of that sword did die around the year 1000 (+- ?). It was from a grave that the glacier river nearby opened up and exposed to the surface. That grave, far as I understand the news did go under a field of lava in the Laki eruption in 1783 (as the idea goes). The people of that time didn’t have a clue that this area contained a grave, unless it was in a form of a story or a myth of some type. I don’t know of any for this area, but local stories is not something I keep track of. According to the latest myth it belonged originally to an Irish settler who was murdered during a local beer-festival after insulting the Chief calling his wife a doormat. The Chief later on was killed also, why that was, I’ll come back to in an OT comment. My reasoning is strange but true. anything that can keep magma away from going further Southwest in the Grimsvotn fissure system towards Lakigigar is a good thing in my opinion. Would much rather have an eruption at Pordarhyrna than Laki. The problem is that Þórðarhyrna is covered by glacier, that means a glacier flood in the case of an eruption and then ash cloud. Far as I can tell based on limited data it seems that Þórðarhryna has an eruption cycle every 80 – 100 years. That means (if the numbers are correct, they might not be) that an eruption might happen in the next few years. Last earthquake activity in Þórðarhyrna was in 2013. I wrote about it. Last confirmed eruption in Þórðarhyrna was in the year 1902, an eruption might have happened in Grímsfjall and Þórðarhyrna in the year 1910, but that is no longer confirmed (it was back in 2013. I don’t know what changed, maybe new research). Jon, It looks like the water flow on many of the outlets from Vatnajokul have had a spike on the 6th of September is this due to weather or is there a sudden melt taking place? Could this be Grímsfjall and Þórðarhyrna having some activity? This would be rain and bad weather in Iceland for the past few days. Temperature also increases the melt water from the glacier, having a large effects on the water levels in the glacier rivers. Thanks the one that really prompted me to ask was the one at Hofn that went from 2.5 ms to 11.1 ms over a 5 hour period around midnight on the 5/6 . So this would be the result of the extra rain not a result of volcanic melt. Porsche 928, maybe the chief was killed by his wife, because he agreed with the man he killed? Maybe she really looked like a doormat? 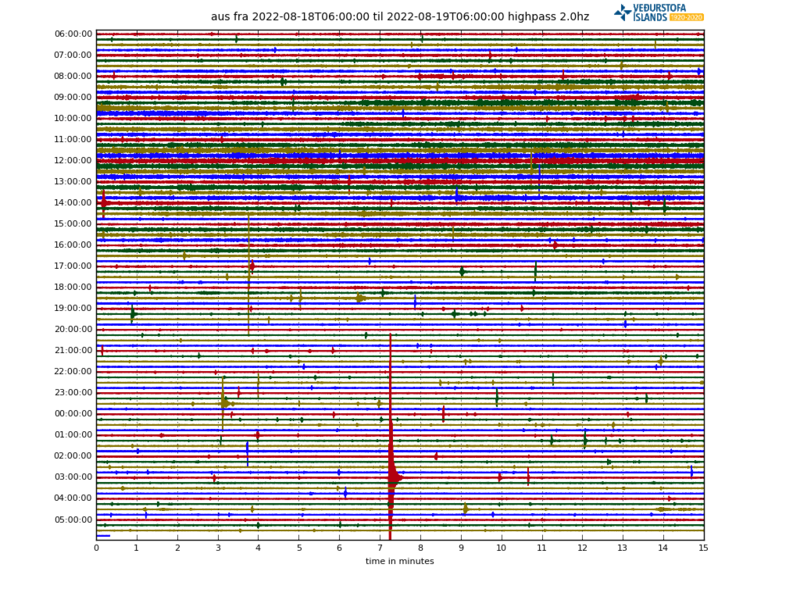 Als lot of quakes by the way near Askja! All deeper then 20 kilometers! There is magma flowing into Askja volcano, creating earthquakes in the process. This has been happening for few years now. When it’s going to result in a eruption is impossible to know. The Irish dude probably had such a bad accent he was misunderstood! We Irish would never say such a thing about a woman, not even sober let alone drunk. Haha yeah you were too fast for me. I think I mean Katla? Good morning Katla… you have a star ? Does anyone know whats happening here? Carl over at the Cafe thinks it might be electronics malfunction.